Several weeks ago, Dr. W. Robert Godfrey posted a 5-part series of blogs on Harold Camping from the perspective of one who knew this apocalyptic radio personality. When Godfrey was a child, he was a member of the same Christian Reformed congregation as Harold Camping—we’re talking, back in the ‘50’s! With this personal connection, Dr. Godfrey was able to introduce us to Camping and his teachings, not from a malicious and mocking point of view, but as one who grieves and prays for Harold Camping and his followers. I highly recommend his series, the links to which are given at the end of this post. In part one, we learn how Camping reads the Bible. Caller: But you’ve had to apply these calculations…and-and-and with the calendars and adding. Nowhere does it say to do that, and that’s leaning to your own understanding. You would have to be perfect in your interpretation and unfallible (sic). 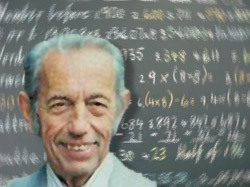 So, we see that according to Harold Camping, theological and hermeneutical expertise is “leaning on one’s own understanding,” but appealing to the laws of mathematics, astronomy and the practice of archaeologists, or looking at the Bible like an engineering book, will not make you misinterpret the Bible. This is the typical attitude of the rationalistic Biblicist. Dr. Godfrey’s blog series is called, “The End of the World According to Harold Camping.” Read parts one, two, three, four, and five. Those who’d like to read an introduction to the proper approach to Scripture can learn a lot by reading The Chicago Statement on Biblical Inerrancy which may be accessed from my “Creeds, Etc.” page.